Folks gathered to celebrate the historic 250th anniversary of Old Pine Street Presbyterian Church in Philadelphia in early June. 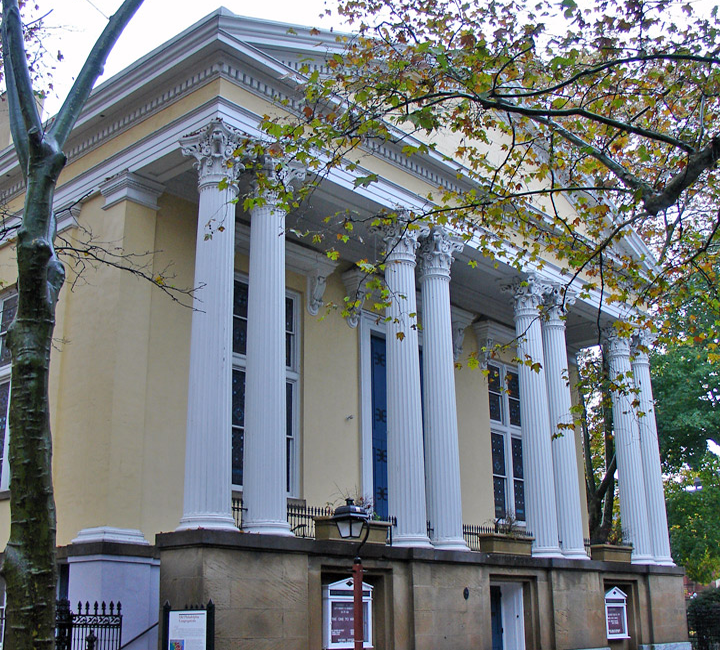 Officially, it’s called the Third, Scots and Mariners Presbyterian Church of Philadelphia area, but it’s better known as Old Pine Street Presbyterian Church. For historians, it’s remembered as the site of a hospital during the Revolutionary War, and for movie-goers, its graveyard is the site of a memorable scene from the Nicolas Cage “National Treasure” film. 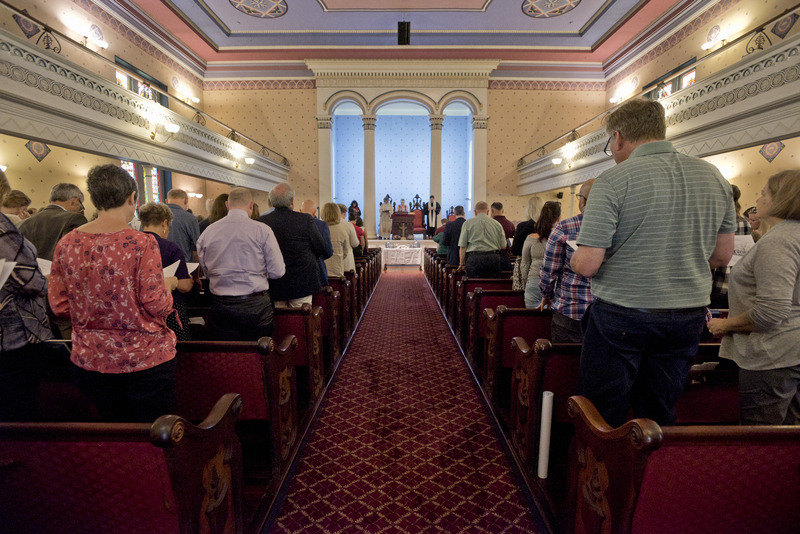 For 250 years, Old Pine Street Presbyterian Church has been all of the above and so much more for a congregation that has resided in the same location a stone’s throw from the Delaware River on the eastern edge of Philadelphia since 1768. 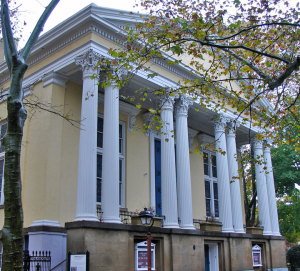 This fact makes the church, which was originally called Third Presbyterian Church, the oldest functioning Presbyterian building in Philadelphia that remains affiliated with its original congregation. Even more important than its history has been Old Pine’s commitment to the community, which has helped keep it going through various downturns and fluctuations in the makeup of the neighborhood. Its Saturday senior citizen luncheon has been going strong for four decades and is just one of many outreaches that keeps the church humming along into the 21st century. Events celebrating its 250th anniversary have been occurring for over a year, with the culmination coming the first weekend in June. On Sunday, June 3, Old Pine Street Church held an anniversary worship service complete with a special sermon, communion, commissioned music and an afternoon potluck picnic. Prior to that on Saturday, a descendants’ tea was held for those who have relatives buried in the church’s graveyard. The festivities began Friday at the Museum of the American Revolution with a celebration of Old Pine’s 250 years of Christian faith and service to the Philadelphia community. Prior to this weekend, conversations on “Faith and Politics,” “Faith and Immigration,” “Faith and War” and “Faith and the Environment” were held since the beginning of 2017. Intermingled with the talks were three concerts, one of which featured the music of famed violinist and longtime Philadelphia Orchestra conductor Eugene Ormandy, who is buried at Old Pine. Offerings from the musical events benefited historic preservation of the church’s grounds. 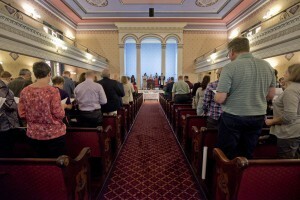 Like many congregations, Old Pine has experienced its share of ups and downs, not only in terms of programming and energy but also, of course, regarding attendance. After a period in the 1940s and ‘50s of low turnouts that almost closed the doors to the church, pastor Bill Pindar arrived in the early 1970s and helped increase the worshiping body and was also behind the construction of an adjacent community center. Bill helped start the “Saturdays for Seniors” program in 1978 that provides a weekly hot meal for low-income seniors. Now in its 40th year, it is one of the most recognizable ministries Old Pine can claim as one of its own. “It’s really become its own community,” Jason said. “We average between 60-70 folks every Saturday. It’s a sit-down meal that we serve. And it’s not just the food, it’s the fellowship. The people who attend really look forward to seeing their friends every week. By the time Jason arrived in late 2011, the membership at Old Pine had dipped to around 100. But in the six-plus years he has been at the helm, he has helped to double the membership by continuing to have the church be an outreach to the community. “We’re experiencing another renaissance,” Jason said. “It’s a really exciting time. It’s just been a really wonderful process of growth and revitalization. We’ve also seen a really amazing growth among young families, which is sort of unusual in mainline churches. Part of that is because Philadelphia has become such a wonderful place to live. In many ways, it’s a miracle the church is still going, considering what it went through during the Revolutionary War. During the winter of 1776-77, the British solders overtook the church building and used it for a hospital and later as a stable for their horses. They ended up burning everything from the church pews to the pulpit to the staircases to the window sashes and frames for firewood to stay warm to combat the brutally-cold weather. “By the time the British left in June we were four walls to the wind with a cedar shake roof over our head,” explained Old Pine historian Ronn Shaffer, who is featured in an anniversary video here talking about the church’s historic graveyard. It resulted in the first of three architectural rebuilds for the structure, leaving it much different now than when it was originally built. “If you approach the building today it looks nothing like it did in Colonial days, because in 1857 session decided to add 18 feet to the front of the building,” Ronn added. “They wanted it to look like a Greek-Roman impressive bank building. 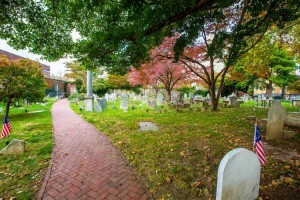 There is plenty of history surrounding the graveyard at Old Pine Street Church. To date, there are 285 documented Revolutionary War soldiers buried in Old Pine’s graveyard. Also among those laid to rest there are three Continental Congress attendees, a signer of the U.S. Constitution (Jared Ingersoll, who is the only delegate who didn’t speak at the hearings) and the Ringer of the Liberty Bell (William Hurry) prior to the first public reading of the Declaration of Independence. Famed Presbyterian minister George Duffield, the chaplain of the First Continental Congress and the first stated clerk of the Presbyterian General Assembly, was the church’s first pastor and is also buried there. Known as the “Church of the Patriots,” John Quincy Adams is documented to have worshiped at Old Pine, and it’s very possible even George Washington stepped foot inside the building in 1783 on a Sunday when he ordered all members of Congress to attend three services on that day, the last of which was at Old Pine. It remained Third Presbyterian Church until the 1950s when the local Scots Presbyterian Church agreed to donate its financial and real estate assets to the congregation, and a short time later the Mariners Presbyterian Church merged its assets to Third Church as well, thus changing the name of the congregation to Third, Scots and Mariners Presbyterian Church of Philadelphia. “But we are affectionately known as Old Pine, a moniker attributable to John Adams himself,” Ronn said. The name and structure of Old Pine Street Presbyterian Church have changed several times in the last 250 years, but what isn’t different is its commitment to the community. And that is something that won’t change anytime soon. “God is working in us and through us,” Jason said. “I have a very Presbyterian way of thinking about things. I think everything that we’re doing is a response. God loved us first, God rescued us first and our task is to respond to his initiative in our lives by trying to love one another and love the world in his name.